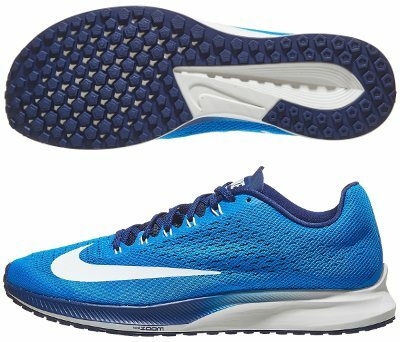 Nike Air Zoom Elite 10 are neutral performance running shoes. It is surprising the limited number of changes in current Nike Air Zoom Elite 10 after high number of them from the american brand in recent months. The bigger sibling from popular racing flat Zoom Streak 6 does not feature React, neither ZoomX foams, nor full length carbon fibre plates... just a simple but reliable running shoe made of high quality materials and at not so inflated retail price tag. Minor tweaks from its predecessor Air Zoom Elite 9 take place in upper where ventilation holes have been redistributed in order to improve breathability. Rest is more or less the same with FlyMesh fabric partially hiding well-known Flywire system embracing midfot for snug fit. The oversized Swoosh™ from the external side follows layout trend from Nike's racing lineup although a bit smaller than one featured in excellent Zoom Fly Flyknit. Gusseted tongue offers soft feeling and great comfort preventing strange movements when running as fast as possible. Rest of Air Zoom Elite 10 remains the same with well know Zoom Air™ unit embedded in Cushlon EVA midsole's forefoot to enhance cushioning and promote quicker response. For those interested in more innovative foams from Nike like mentioned ZoomX and React, the disruptive Zoom Pegasus Turbo is worth a try. There is no change in outsole either which repeats multiple pentagonal shape lugs configuration so distinctive from popular Air Zoom Pegasus 35 to not only adapt better to terrain with increased flexibility but also provide great traction for easier swing phase.